Share Price of our Company has fallen from Rs. 90/- per share to Rs. 12.50 per share in the last one year. The reason for fall in the share price was as the losses were suffered by our company. Recently, the share price was Rs. 12.50 per share and the same has been increased to Rs 20.50 as today’s price. 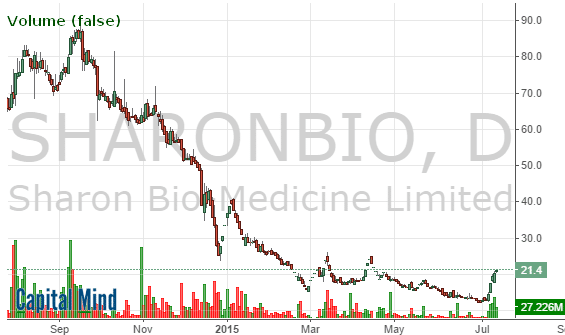 The increase in share price may be as the share price of Sharon Bio-Medicine is already gone down and investors may be looking for the best of the opportunity to buy the shares at this point. Meanwhile, from June 29, 2015 at one of the manufacturing plant at MIDC, Taloja near Navi Mumbai the US FDA is concluded and we are understanding the outcome of US FDA Inspection. The US FDA Audit was completed on July 07, 2015 night. Further, also note that there are hundred of share investors being added to our Company every week inspite of shares being sold by one of the Promoter in the last one month. Further note our Company has nothing to do with increase in the share price of our Company.